In 1271, when Marco Polo was 17 years old, he set off from Italy along with his father, Niccolò, and his uncle, Maffeo, to travel to Asia. After a journey of more than 15,000 miles, they returned to Venice 24 years later. At the time of their return, Venice was at war with Genoa, which resulted in Marco’s imprisonment. 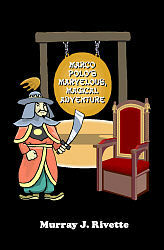 From his cell, Marco dictated his many travel adventures to a fellow inmate and these stories were later published as The Travels of Marco Polo (Il Milione). Marco was eventually freed and went on to become a wealthy merchant. In 1300, Marco married the daughter of an Italian merchant and had three daughters.